“Ninety-nine degrees in Klamath Falls tomorrow” Ted announced, glancing at the weather report. “Good thing we’re leaving for the coast”, Sylvia replied. 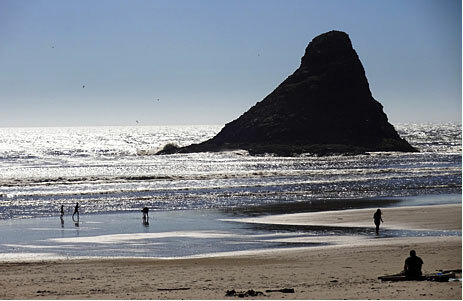 We'd been to the California and Oregon coasts before, but this time, Ted-the-Travel-Agent did his usual meticulous research, planning to stop at locations that we had not visited before. His ultimate goal: to stay at lodgings that are really on the oceanfront, rather than "across the highway" from the oceanfront. Amtrak does not go to the coast, so Ted and Sylvia drove their land yacht. Motoring from Klamath Falls to Yachats - our northernmost destination - we dodged logging trucks and men at work on the highway. We journeyed through a coastal rain forest lush with ferns and evergreens, and pink rhododendrons growing wild. On the Umpqua River near Reedsport we observed a large herd of elk at a wildlife viewing area, but mostly there were long stretches of untouched scenery. 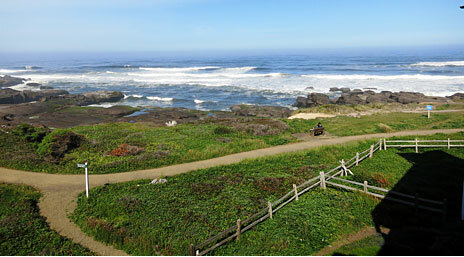 Proceeding north along Highway 101, we past towering dunes to our left and unexpected fresh water lakes to our right. Vendors displayed roadside collections of logs, roughly sawed into shapes of life-sized seafaring old-timers, or bears, for sale. From our verandah at The Overleaf Lodge. Checking into The Overleaf Lodge at Yachats we noticed license plates from Arizona, Florida, Idaho, Nevada, Utah and Wisconsin. 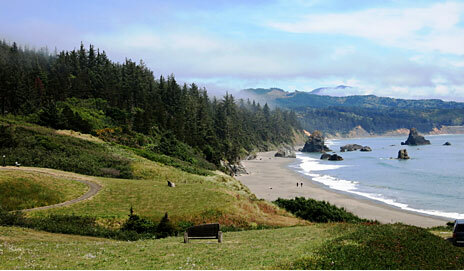 Tourists from all over the USA come to see this wild and unusual coastal scenery. As we settled onto our ocean-front verandah, Ted exclaimed "Thar She Blows," the traditional cry from lookouts aboard the old whaling ships, as he pointed out to sea. A tall white plume of spray appeared off shore, and then two more, gradually fading to ghostly white and dissipating in the wind. Gray whales were beginning their sojourn from Baja California towards Alaska for the summer season, marking their presence by surfacing to exhale, blowing away water which accumulated around their blow holes. We spent many idle hours enjoying the gentle, cooling, sea breezes. Below us were ledges of basalt. The edges formed many V-shape openings, so the waves met increased resistance as they approached the narrow part of the channel and sent spray flying into the air. 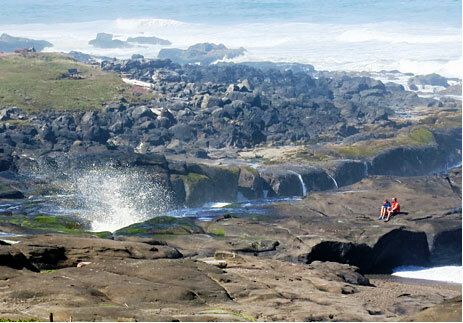 Intrepid vacationers enjoy wave action from their basaltic lava perch. The next morning, a buffet breakfast was served in the main lobby at tables with an ocean view. Fine dining on the coast is illusive. We loaded up on fruit and power bars for our lunch and dinner meals and enjoyed excellent inclusive breakfasts at many of our hotels. 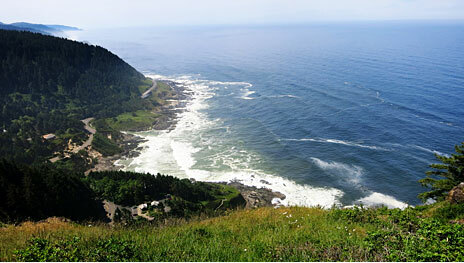 The overlook atop Cape Perpetua is the highest road on the Oregon coast, and provides stunning views from its location 802 feet above sea level. A stone shelter built by the CCC in the 1930s was used as a lookout by our military during WW II. Wildflowers of orange, white, yellow and purple lined the meadows adjacent to the highway. Redfish, a restaurant at the southern edge of Port Orford, had the most extensive wine list on the coast, describing many categories of wine, mostly from Oregon. View from our table at Redfish. At Gold Beach the Pacific Reef Resort was our overnight stop. Black sand streaks on the beach indicate the presence of gold, which was mined here from 1850 until the 1940s. The seaside view from our beautifully furnished room was a long shot, no more than a blue horizon way off over bushes and trees. A private patio with comfortable Adirondack chairs overlooked the extensive lawn, and unexpectedly, an outdoor movie screen. After sunset, as we were being lulled to sleep by the soft sounds of the distant Pacific surf, dazzling movie projector lights suddenly flickered throughout the dark shadows of our room, and we were overwhelmed by a stereo surround soundtrack accompanying a movie about the pleasures of touring the Oregon Coast. 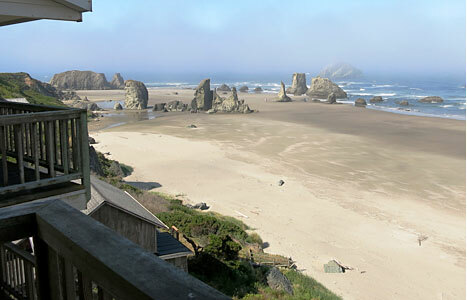 Sea stacks viewed from the deck of Room 354 at the Sunset Oceanfront Lodging at Bandon. 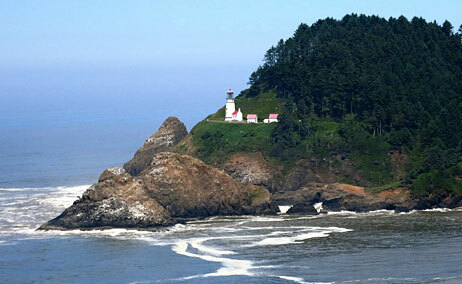 The most photographed lighthouse on the Oregon Coast, Heceta Head. 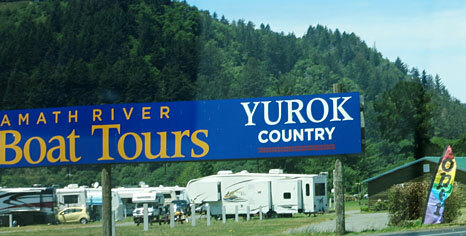 The Yurok Tribe offers Jet Boat Tours on the Klamath River. 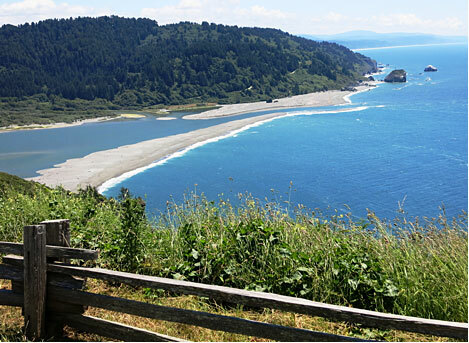 The Klamath River meets the Pacific Ocean from an overlook 650 feet above sea level. As we continued south into California, trucks with loads of freshly-harvested logs were in evidence. Some heading north, others heading south. US Highway 101 is subject to erosion and sinking caused by unstable soils along the coast, challenging the many highway maintenance crews we observed. 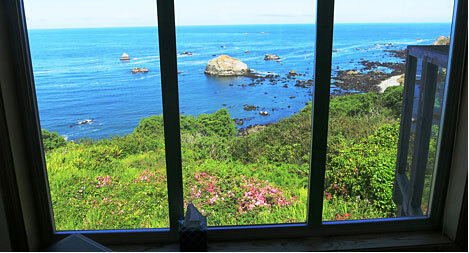 Arriving at Trinidad, CA, on a foggy afternoon, we checked into cozy Turtle Rocks B&B, which became our favorite. The verandah of Room 3 overlooked the gardens and a view of the sea and Patrick's Point State Park. Afternoon chocolate chip cookies, cake, fresh fruit, and carbonated beverages awaited. Our room boasted a sofa facing a large picture window, with an electric old-fashioned-looking stove with real-looking flames. A very comfortable king bed was welcome. A comfortable downstairs recreation room, where breakfast and afternoon desserts were served, was furnished with tables, sofas, and an eclectic selection of books and magazines. View from Room 3 when the fog lifted. We were sorry to leave, but the Turtle Rocks was completely sold out for the coming weekend. Ted glanced at the weather report. “It’s going to be 64 in Klamath Falls,” he marveled. Time to head for home. The heat wave was over. 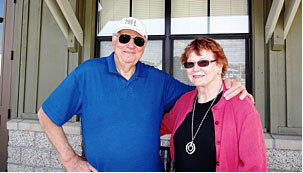 We are Ted and Sylvia Blishak, who not only write about trains, but also plan customized North America vacations -- with more experience booking rail trips than any other travel agents in the US! Are you a vacationer who wants to travel at your own pace -- to destinations that you choose? We are your travel agency! Please visit http://www.traintravelconsulting.com, email sylvia@traintravelconsulting.com, or phone 1-541-887-6025.